Seattle indie rock math-heads cool off on their third proper full-length, but remain rock solid. Seattle quintet Minus the Bear used to be the kind of band whose song titles were replete with exclamation marks, assorted critters, and the use of the word "man" as a casual form of address (as in "Lemurs, Man, Lemurs"). But I'm not here to bore you with the over-played card of longing for the so-called glory days when a given band were all frisky and new. Yeah, Minus the Bear have matured since their 2001 EP debut, This Is What I Know About Being Gigantic. Their initial fire has chilled somewhat, but this hasn't been to the band's detriment. They remain rock solid and have espanded their sound. 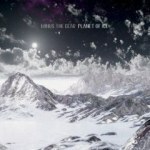 Planet of Ice is their third proper full-length (let's not count the remix project, Interpretaciones del Oso), and Minus the Bear have discovered the wider spaces along the frozen planes. Sound molecules hang suspended in air and bounce off the glass-like planes of ice caves. I'm not saying that they've become entirely glacial in their tempos. Let's leave that to Sigur Rós. But, relative to their 2002 debut LP, Highly Refined Pirates, the band's rock attack has cooled a bit. This actually allows more room for the guitar work of David Knudson to sparkle, bend, and chime. His sound is precise, smooth, and synthetically clean -- his tone alone should disqualify him from being a totally rad musician, and yet it's clear upon listening to his deft execution of intricate tapping techniques that he belongs in the pantheon of guitar gods typically reserved for metal shredders. Fortunately, he avoids the pat trappings of those kinds of guitarists. Instead, he combines the art/prog leanings of Jonny Greenwood with the sharp-yet-headily phrased chordings of Jesus Lizard-era Duane Denison and the loop-sampled trickery of Bill Frisell. In a word: wow. On Planet of Ice, he moves away from his earlier Eddie Van Halen-esque harmonic fret runs to become the "slowhand" of math rock. He also pretty much steals the show. Or maybe that's obvious from the drooling-with-praise paragraph devoted entirely to a guy who comprises but 20 percent of the band's lineup. The four other dudes in Minus the Bear deserve some love, too. The rhythm section of drummer Erin Tate and Cory Murchy is a tight unit, capable of quick changes, landing square on the off beats, and spinning a mighty fine range of dynamics. And Alex Rose, on keyboards and saxophone, imbues the album with lovely atmospherics and a welcome undertone of Dark Side of the Moon. Vocalist Jake Snider is a tricky one to figure out, though. He's got a beautifully textured voice and sings emphatically enough -- sometimes just a shade below emo level over-the-topness. Still, he's always had a tendency to slip too easily into the mix, his voice becoming just another pleasing part of the whole. Maybe it's because his lyrics are also a little slippery, a little indistinct. I mean, I dig the general vibe of lines like, "We'll watch her roll in from the south / She'll wrap her sheets 'round us", but the hell is he talking about? Or, "Wide eyed and so discrete, a maintenance touch / Makes prose from poetry and it don't mean much." Hm, I'm inclined to agree. But, from that same song, "Dr. L'Ling", I do love: "I was afraid / Of becoming a casual business man / On matters of the heart." Sure, the love-as-clothing metaphor Rose builds during the first verse is a little labored, but the pay-off is nice. In fact, the whole album is nice. Or, perhaps what I mean is, it's easy to like. Yes, Minus the Bear used to rock us harder. But don't make the mistake of bemoaning their more mature sound on Planet of Ice, just because the band's optimal listening environment has moved from the car stereo to the living room floor. This is headphone indie rock, but with plenty of wondrous aural attractions to keep your wandering mind from straying too far. And, just in case you were worried that the band had entirely forgotten how to rock, the boys bust loose in the middle of the album's epic closer, the nearly nine-minute long "Lotus". It's a great finale to an album that is solidly quite good, falling just a step shy of excellence. Still, there are many excellent moments within, especially those created by the guitar work of David Knudson. Thanks in large part to his inventive playing, Planet of Ice offers a world of cool sounds.